Language Adventures is a first-of-its-kind app that allows you to engage students in a contextual language intervention experience on your iPad! All the basics of game play—player selection, dice rolling, and token moving— have been transformed for the iPad platform. 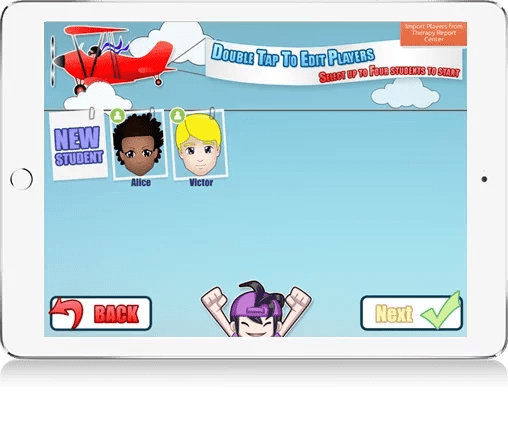 Additionally, the app allows you to select from three levels of difficulty appropriate for elementary through high school-aged students, with accompanying school-based themes and vocabulary contexts, and save your students’ targets and progress over repeated plays. 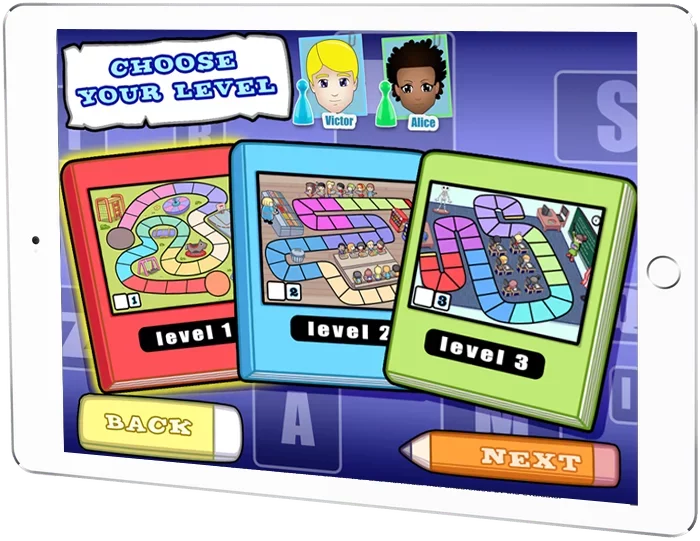 Question targets are related to the topics of each leveled game board (playground, cafeteria, and classroom), so that they are grounded in a stronger context to enhance students’ comprehension, semantic connections and use of more complex vocabulary. 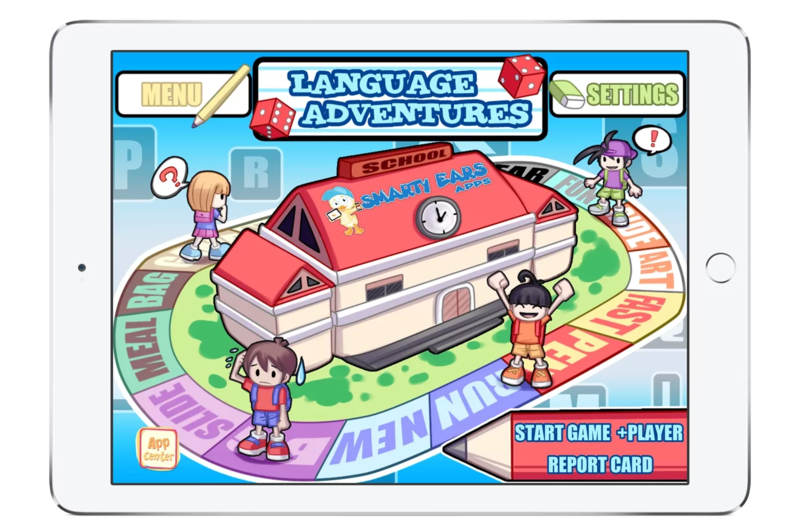 Language Adventures is a new spin on your old speech and language game boards, a first-of-its-kind app that allowa you to engage students in a contextual language intervention experience on your iPad! Work in an adult-student pair or group of students on a variety of receptive and expressive language skills. Develop vocabulary, naming, comprehension, nd inferential reasoning in the context of real-world settings. Elicit and score students’ understanding and use of targeted language skills. Measure treatment effectiveness and skill growth over time through reported data. The level 1 takes place in the playground and it is designed for younger children. All questions themed width the playground theme location in mind. This level takes place in the cafeteria and questions are slightly more complex than what is used on the LEVEL 1. Level 3 is the classroom and the questions on this level are the most complex ones on the app. Language Adventures delivers content in a way that the adventure never seems to end! Language Adventures provides comprehensive and detailed data for each player. Results are automatically saved from each session that include the session date, target(s) played, activity played (receptive or expressive), game level played, the number of items played on each particular target, and accuracy of each target. Additionally the results contain a colorful overall accuracy graph that combines the accuracy of all the sessions per each target, making it easy to see which targets a player is succeeding at, and which targets offer an opportunity for improvement. Help keep the students’ parents, teachers, or administrators connected and involved by tapping on the “share” button which allows for the data to be emailed or printed. Fully compatible with Therapy Report Center (a free app), all student results can easily be exported to TRC at the tap of a button, therefore making it fast to build detailed progress reports based off of the data from all of your Smarty Ears apps! Almost 1000 built questions still not enough? Some questions not a good fit for your particular player(s)? Language Adventures is based on research regarding language development and use of context clues to increase overall language skills, reading comprehension, and academic success. Research has indicated that targeting vocabulary facilitates reading comprehension and oral language skills (Dole, Sloan, and Trathen, 1995). The questions within Language Adventures are presented within real-world themes providing context clues to assist in learning vocabulary. By providing context-based questions and a thematic approach, Language Adventures assists children in strengthening word connections and developing meaningful concepts (Hickman, et al. 2004). Within the content of Language Adventures, the child is provided with meaningful learning activities related to their own experiences and encouraged to use student-friendly definitions of words within the app, which enhance language comprehension and production (Beck, et al., 2002). Many researchers have supported teaching antonyms (Powell, 1986), synonyms (Graves et al., 2004), and multiple meanings (Nagy and Scott, 2000) to increase overall vocabulary usage. Language Adventures now includes content targeting categorization, a skill challenging to students with language disorders and impacting comprehension, labeling, and retrieval (Partyka & Kresheck, 1983). Language Adventures also provides new material which can be used as a context to practice strategies related to comprehension of wh-questions and inferential reasoning. From the main menu select the “start game” button on the bottom right. This will bring you to the players’ menu. After creating at least one player, select anywhere between 1 and 4 players by touching their pictures. A “selected” game token will appear on each of the players that you select. The player who is chosen first is given the blue token, the second player is given the green token, the third player is given the red token, the fourth player is given the yellow token. When you are finished selecting the player(s) press the “done” button in the bottom right corner. This will prompt you to select the level of difficulty for the game. Select a difficulty level for the game by tapping one of the three books: level 1, level 2, or level 3. The selected book will have a yellow glow that outlines the book to indicate that it is selected. Then press “next” in the bottom right corner to start the game.! 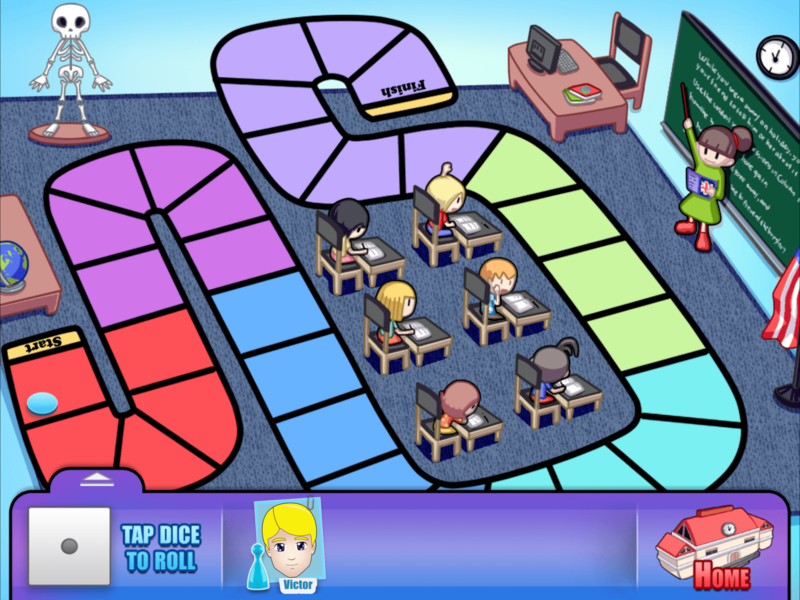 !Level 1 uses a playground theme and is great for most early elementary students. Level 2 uses the cafeteria theme and works well for late elementary to early middle school. Level 3 uses the classroom theme and has challenging questions that work well from middle school into early high school. These are just general guidelines as the adult working with the student(s) should have a better understanding of challenge is appropriate for their particular student(s). At the beginning of the game and before each turn a screen appears identifying whose turn it is. The players are at the bottom of the screen; the player furthest left is the one whose turn it currently is. Pressing the arrow above the dice will hide the bottom menu. Pressing the home button in the bottom right will end the game. The current player must tap on the dice in the bottom left corner. This will roll the dice. After tapping on the dice in the bottom left, the dice will roll; shortly afterwards the bottom menu with the players will disappear (you can press the purple arrow in the bottom right to look back at what number was rolled or the players). The player is to move their player forward by tapping on the space that corresponds to the dice number. The player’s game token will then move forward. A question that corresponds to the player’s selected target will appear. Receptive Activity in which students identify correct answers from presented choices. Expressive Activity in which students respond to open-ended questions. Approximately 1000 questions across 6 language targets, 2000 when considering that questions can be presented in Receptive or Expressive Mode, making this app a robust therapy resource! Ability to select specific targets- synonyms, antonyms, multiple meanings, categories, whquestions, and inferences- for each player. Theme-based game board format to be used with up to 4 players. Three available levels targeting elementary through high school students. Questions presented in both auditory (optional) and visual modalities. Questions containing content words and context clues to increase understanding of targets. Audio can be turned on or off to develop auditory or reading comprehension.